UFO Reality has been covered up for seven decades - a government-led process that is now so ingrained within our culture that it is essentially self-perpetuating. Indeed, the democratic branches of government are as much kept in the dark as the rest of us, preventing proper scrutiny and oversight of this deep, dark area of (inter-)national security. That's the belief of Ufologists the world over. Based upon the mountains of case-files down the years, and carefully investigated evidence of the strongest cases, it's accepted by many of us who read and study the subject that we are not alone. Further, we are visited regularly and surreptitiously by other intelligences whose agenda remains unclear, and whose technological capabilities shed a light on how backwards we must appear to them. 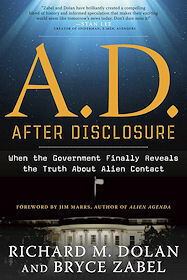 Such a process has created plausible deniability for the governments of the world, and shifted UFO secrecy into a legal hinterland where no one is truly accountable (pp68-72). The authors consider the witch-hunts that will emerge from the Disclosure process, as the perpetrators of decades of denial and obfuscation are exposed. The Media, itself culpable of blinkered perception for decades, will go after those who have successfully deceived us all with the fervour of the converted. This, alone, could explain the continuing lack of Disclosure, I think, although there's more than that to consider, as I'll set out below. The authors suspect some kind of general amnesty would be invoked by the Executive, but there are hints in the book from insider sources that not even a pardon by the President of the U.S. himself would be enough to assuage their fears of the personal ramifications of full Disclosure. I believe them. On the plus side, the scientific data on UFO technology, hidden all these years should emerge into the light, allowing scientists to make leaps forward. Well, that's the theory anyway. Personally, I can't imagine the Americans wanting Chinese technologists to be the first to crack zero-point energy, or electrogravitics, especially as the classified science that has gone on behind the scenes in black project work has evidently failed to get results from back-engineering in all the years they've had this stuff locked up. As one moves through the book, it becomes clear that the many sensible and rational points raised by the authors create a double-edged sword. Of course, divulging UFO secrets and the Big Picture in general would be good for humanity. But the many dangers inherent in that process are, frankly, terrifying. The authors are right to indicate the threat to our global economic system. Not only would there be an initial panic in the markets, but so many of the institutions that hold our society together would be in the spotlight for their utter incompetence and denigration of duty down the years, that faith in our very system would be severely rocked - much as the 2008 banking crisis and its aftermath has exposed wanton failure in the financial sector. The true nature of power in the world would be exposed, further undermining our sense of democratic accountability and institutional propriety. Cynicism would quickly turn to anger. Then there's security - a subject inadequately tackled by the authors, whose overall coverage of the Dsiclosure topic seems, at first glance, pretty comprehensive. If the Others are abducting our citizens, then the onus will be on our governments to protect our citizens from this process, and to defend our skies. That might seem like the equivalent of trying to shoot down fighter jets with mediaeval catapults, but nevertheless that's what the people will expect the governments to do, and do successfully. Imagine abductees appearing on day-time TV, post-Disclosure, with their horrific accounts of their experiences, and how that will play in the media. Simply put, the governments will have to admit that they cannot offer adequate security in the face of UFO activity, and in-so-doing will be admitting their failure to meet their primary obligation to their citizenry. Perhaps the authors left out such arguments because they realise that far from rationally advocating Disclosure they would find themselves undermining its potential. It's ironic, then, that in some ways the military-industrial complex would actually have the most to gain from Disclosure. Why? Because a frightened public would demand a massive upgrade of our air-defences, and a huge investment in space-based defence technology. Far from berating aerospace corporations for their historical collusion with secret government committees, the indebted public purse would throw trillions more at them in the hope of protecting our world from a perceived external threat. Perhaps we will, but there's no place for triumphalism yet. I think Disclosure is a long way off, and (as I've intimated in my own novels) will be dragged out of the governments of the world kicking and screaming. Subtitled "When the Government Finally Reveals the Truth about Alien Contact"